A beautiful, tranquil inn on a quiet, leafy street only a short walk from the center of Rockland, Maine. LimeRock Inn, on a quiet, shady street only a short walk from the center of Rockland, Maine, has eight guest rooms with bath and a welcome tranquillity. The owners/innkeepers, Frank and PJ, will proudly tell you that the inn's spirit is exemplified in its wraparound porch with wicker furniture, its formal turn-of-the-century parlor, and its comfy library. The comforts are up to date, however. There's free Wifi throughout the inn, a computer for guests' use, fax service, and a guest services alcove furnished with hot and cold beverages and snacks available to guests at all times, at no additional charge. A table d'hote breakfast is served to you in the dining room each morning by the cheerful owners, who are happy to accommodate any food sensitivities. 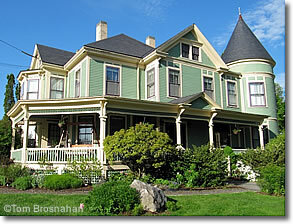 LimeRock Inn, with its wonderful wraparound porch.